This page provides instructions on how to update the firmware for Digital Photo Frame DPF-D830 and DPF-D830L. 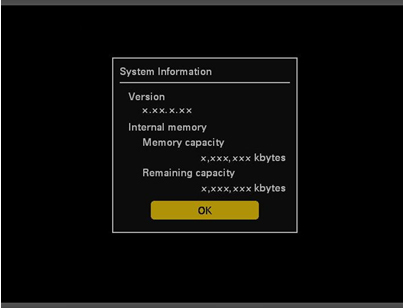 - If the version is displayed as 1.26 or lower, update the firmware in accordance with below procedures. - If the version is displayed as 1.33 or higher, you do not need to update the firmware. Improves charge characteristic of the drained built-in battery. Fixed issue where power of the digital photo frame may be turned on by the remote control of products other than a Sony digital photo frame. This is the dedicated update file for DPF-D830/DPF-D830L only. 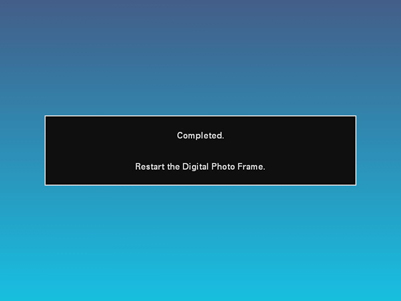 You cannot use this file with other Sony digital photo frames. Save the file DFD830V2.zip to your desktop. Right-click the downloaded zip file DFD830V2.zip. The DFD830V2 folder is now open on your computer's desktop. Right-click the downloaded zip file DFD830V2. Double-click the saved file DFD830V2.zip. The DFD830V2 folder is created on your desktop. The extracted DFD830V2 folder contains the following update files. We do not recommend initializing (formatting) with a computer, as the DPF-D830/DPF-D830L may not recognize the recording medium, depending on the type of initialization format. If you have no choice but to use a recording medium that has been initialized with a computer, copy a JPEG image file and check to see if it is displayed correctly on the DPF-D830/DPF-D830L. Open the DFD830V2 folder on your desktop, and copy the update file DFD830V2.VUP inside it to the Memory Stick™/Memory Stick Duo™. Open the DFD830V2 folder on your desktop, and copy the update file DFD830V2.VUP inside it to the Memory Stick™/Memory Stick Duo™ that you have inserted into your digital camera. The digital photo frame is automatically turned on. Press the (Power) button and make sure the power turns off (that the (Power) button is red). The power will not turn on when the (Power) button is lit in orange even if you press the (Power) button while holding down the VIEW MODE button. Charge the internal battery, and when the (Power) button turns red, perform Update the firmware again. 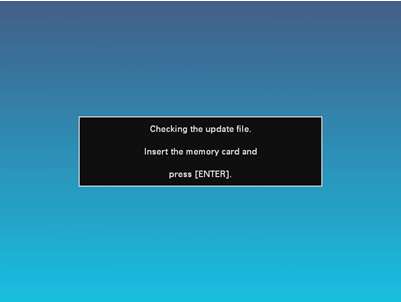 The LCD screen changes to the Updating... screen, and the firmware update starts. It takes about 2 or 3 minutes to perform the firmware. Check the firmware version is 1.33.